Product Overview Get ready to meet a different kind of Brute. A drum machine with attitude, DrumBrute Impact is an addictively fun, instantly satisfying beat maker with a beefy, unique voice. Featuring amazing performance controls, superb connectivity, and analog sounds that will give your music a powerful, visceral energy. 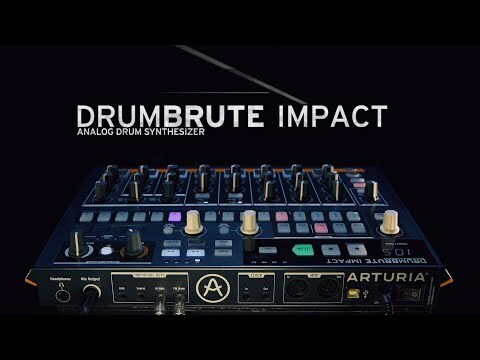 Putting the focus on "Brute", DrumBrute Impact features 10 high-energy, refined, punchy analog sounds. It uses "Color" sound-shapers to introduce unique, per-instrument effects for some tonal variation. Boost the harmonic content, add some drive, snap, or crack at the touch of a button, or create automated changes by creating a "Color" sequence. If you want your drums to push even harder, there's a built-in distortion with drum-optimized crunch. DrumBrute Impact is a drum machine for musicians and producers who crave raw power and awesome tone, complementing its cleaner sounding brother: DrumBrute. Sharing the same prize-winning, prize-fighting sequencing architecture of the original DrumBrute, you'll love the simple, fun, and intuitive sequencer in DrumBrute Impact. Create complex phasing polyrhythms and straight, pounding rhythms; record a finger-drumming performance; punch in a step-sequenced masterpiece; everything is a joy. Use the touch strip to create some real-time glitchy, beat-repeat breakdowns, spice up a single instrument or your whole pattern with a dedicated 'Random' knob, and add some syncopation and groove with the 'Swing' feature. Get away from computer screens, say goodbye to sub-menus, and jump into the world of tactile satisfaction. Connect to your other gear, sync up, and make some music the old-school way. Featuring a huge array of sync and connectivity options, you'll be able to hook up and jam with practically any other synth, sequencer, or MIDI-enabled instrument. Save your patterns, chain them together, and create full songs and live sets. DrumBrute Impact is a massive sounding, creativity fueling beast, with effortless workflow and amazing performance controls. Features • 10 in-your-face analog sounds: high-impact drum sounds, including a chest-pounding kick, two face-slapping snares, hi and low toms, a zingy cymbal, searing hats, a massive FM synth sound, and a cowbell. • Powerful sequencer: 64 patterns with up to 64 steps. • Polyrhythm: set unique pattern lengths for each instrument. • Looper: for glitchy beat-repeats. • Roller: add per instrument drum fills. • Songs: chain up to 16 patterns, save up to 16 songs. • Swing: add some groove to your rhythm, either globally or per drum. • Randomness: add unpredictable variations to your pattern. • Output distortion: rich, specially voiced distortion on the output to add some filth when you need it, and bypass when you don’t. • Sync to anything: connect to practically any hardware or software instruments, sequencers, or interfaces with MIDI, clock, or USB. • Metronome: removed from the main output when headphones are connected, so you hear it and not your audience. • Group outputs: 4 additional outputs to send the Kick, Snares, Hi Hats, or the FM Sound out separately for post-processing. • Color: unique to DrumBrute Impact, “Color” can be activated per instrument, or per step. Color adds overdrive to the kick, make the snares snap and crack, and excites the hats, toms, and FM sound.